When will be Birdman and the Galaxy Trio next episode air date? Is Birdman and the Galaxy Trio renewed or cancelled? Where to countdown Birdman and the Galaxy Trio air dates? Is Birdman and the Galaxy Trio worth watching? In 1967, Hanna-Barbera sought to capitalize on the popularity of Saturday Morning superhero shows such as Space Ghost and Dino Boy and The Herculoids. To this end, it asked Alex Toth for a new character, and he created Birdman and the Galaxy Trio. 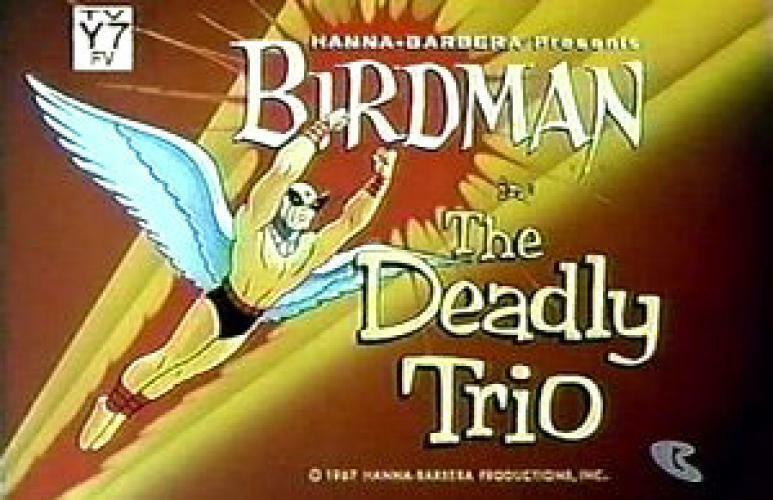 Each episode consisted of two seven minute or so episodes of Birdman, with a 7 minute or so episode of The Galaxy Trio sandwiched in between them. Birdman, occasionally known as Ray Randall, received some manner of powers from the Egyptian sun god, Ra. This endowment enabled him to fly - although he possessed wings, he never seemed to flap them, and perhaps flew without using them. When fully charged, he could create a solar shield substantial enough to deflect most attacks, and fire powerful energy blasts with a variety of functions (mostly destructive). Birdman relied heavily upon the sun for his power, and almost every episode suffered a debilitating loss of power from being away from the sun too long (either underground, indoors, undersea, or because a villain blocked the sun's rays). In this circumstance, he frequently relied on the help of his pet and companion, a very large purple eagle named Avenger. Birdman's mysterious employer, Falcon 7, was never identified by affiliation, but is generally assumed to work for some part of the United States government, as Birdman enjoyed access to military personnel and bases. Birdman fought everything from mad scientists to extraplanetary menaces. The Galaxy Trio takes place at some unspecified point in the future (future Earth is depicted in a few episodes). The team is Vapor Man, who can become intangible and emit a variety of useful vapors (insert your own joke here). He led the team, and was assisted by Meteor Man, able to enlarge any part of his body and Gravity Girl, able to fly and to remove gravity's influence from other objects. They patrolled the galaxy in response to threats from everything ranging from high tech despots to mechanical men gone berserk. Cartoon Network's Adult Swim created a sort of spin-off, Harvey Birdman, Attorney at Law, that takes place long after Birdman's retirement as a superhero. Falcon 7 appears, and we learn his real name is Phil Ken Sebben. Many of Birdman's enemies appear from time to time, often as judges or opposing counsel. EpisoDate.com is your TV show guide to Countdown Birdman and the Galaxy Trio Episode Air Dates and to stay in touch with Birdman and the Galaxy Trio next episode Air Date and your others favorite TV Shows. Add the shows you like to a "Watchlist" and let the site take it from there.